It has been a gorgeous summer. Having spent two months in both UK and Singapore, I am now settled nicely back in Maryland, USA. In Asia, drama classes in various countries have been ongoing while others have taken a couple of months break. Classes will be commencing in Hong Kong, Macau, Chaoyang as well as ongoing in many studios and schools in Singapore. Find an Academy near you - www.helenogrady.com.sg. Mini-script presentation on stage in Hong Kong school. Drama provides children more than theatrical performance opportunities. They develop public speaking skills that provide them with opportunities from school oratorical all the way to the boardroom. 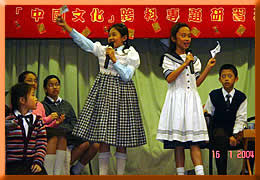 This two students are performing a mini-script in a school in Hong Kong.